Quick side note – it’s lightly storming right now. You know…steady rain, subtle rumbles of thunder, rare lightning. When it’s not scary (like tornado warning) thunderstorms are actually kind of soothing to me. I like writing during weather like this. It also makes me think of the Rainforest Cafe (specifically the one in Disney World) every time. End random thought. This sandwich is another easy peasy lemon squeezy recipe and it tastes like summer! Few combinations are better to me than fresh basil and just picked tomatoes and then you add yummy melted cheese to the mix? Perfection. Joanna suggests havarti cheese because it melts well and she’s spot on there. Obvious by the photos isn’t it? If you don’t like that type of cheese though, I actually made a similar sandwich on my old blog back in the day! It calls for mozzarella cheese, tomato and basil. The bread is seasoned as well by rubbing garlic, brushing olive oil and sprinkling garlic pepper seasoning on each slice. Check it out here if you’re interested! Back to that ‘exciting’ stuff. Last weekend we watched the movie Game Night; it is absolutely rental worthy! First of all, Jason Bateman. If he’s in the movie, I’m probably going to watch it. Second, it’s really entertaining and has some fun twists throughout! Yes, a handful of funny moments were in the previews, but there’s plenty others too! Bottom line…plan a fun date night at home and rent this movie! In the TV realm, we finally started season five of Silicon Valley which premiered in March! That’s because we don’t pay for HBO year round. Speaking of which, if any of you have Hulu already check into the deal we just took advantage of where you can get HBO through Hulu for $5 a month for five months! Awesome deal!! And then watch Silicon Valley, because this season has provided some good laughs already! You programmers and IT folks will especially appreciate the show! We’re also just getting started on season two of West World. There’s really not another show like it out there. Add that one to your list too. Last but not least, ‘For the First Time’ by Darius Rucker is one of my favorite country songs right now! It’s so catchy and what a great reminder that we always need to venture out, try something new and have fun! Enjoy! Spread the mayonnaise on both sides of each slice of bread. 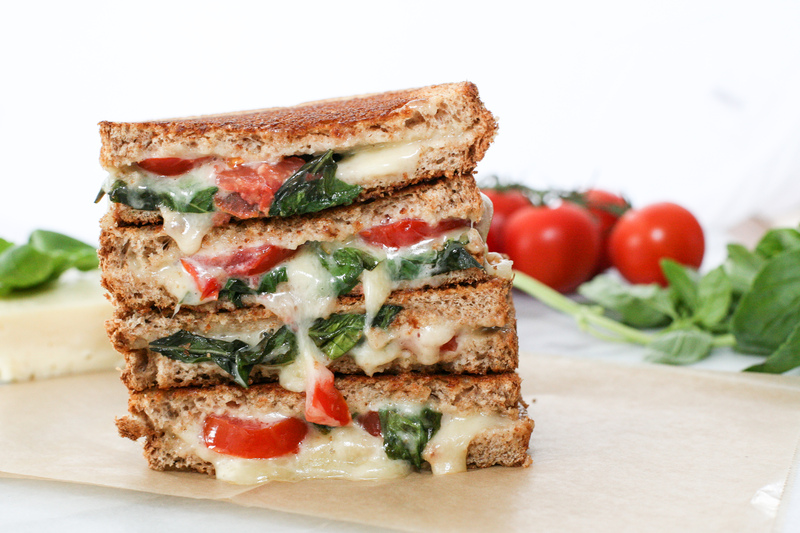 On 4 slices of bread, layer 1 slice of cheese, 2 tomato slices, basil leaves and another slice of cheese. Top each with remaining slices of bread. Heat a large skillet over medium heat. Toast the sandwiches until browned on both sides and cheese melted, 4 to 7 minutes. Flip sandwiches halfway through. I wrote the recipe above as it's written in the Magnolia Table Cookbook. I've never used mayonnaise instead of butter when grilling sandwiches and wasn't feeling adventurous enough this particular day to switch things up! Either one works, just base it on your preference! This entry was posted in Lunch, Recipe Book and tagged grilled cheese, havarti cheese, lunch ideas, magnolia, magnolia table cookbook, summer lunch recipes, summer recipes, tomato and basil. Bookmark the permalink.